And if it wasn't for our 3DS's our family would never leave the house. Car rides are the worst for us. I get car sick and I am horrible with directions. So I need the car to be quiet. My boys tend to fight in the car and kick the back of my seat. I just can't have this so I started to let them bring their game systems along. The first car ride was quiet. Almost to quite I kept turning around to make sure they were both still alive lol After 3 years though it has become the new norm. And our once hectic car rides are now a thing of the past. My boys adore their 3DS's and I am always on the look out for new kid friendly games. Explore six different Disney-themed worlds from classics like Disney Frozen, Disney The Little Mermaid, and Walt Disney Lilo & Stitch. You can harvest a field with Winnie the Pooh, fish with Donald Duck, mine with the Seven Dwarves, explore ghost-filled dungeons for treasures, and more! On your journey, you’ll discover the magical town of Castleton, where you’ll live amongst classic Disney characters. Shop with Daisy, Minnie, and others to build and buy hundreds of Disney-themed items. You can customize amazing outfits and even decorate your dream home and Café. Ready to make a memory? Then dance at the Enchanted Ball or throw a Café Party with your new Disney friends! 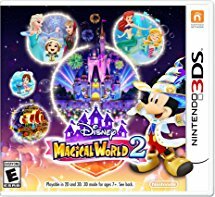 All this magic is at the tip of your fingers with Disney Magical World 2. With so much to do it is like having several games in one! Some of the activities are fun for my 9 year old and others are just the right speed for my 5 year old.